Thinking about flooring renovation? If your heart is set on tile or stone, there are a few things you’ll have to consider. Obviously, you’ll need to choose a size, type, and color of tile best for the room you’re renovating. And, you’ll have to select a tile pattern in which your flooring will be placed. To help, we’ve come up with a list of tile pattern ideas to consider before you go out shopping for your flooring! How you lay your tiles is completely up to you. But, there are a few pros and cons to each style of tile layout. So, it’s important to weigh these pros and cons before you select and buy tiling. This way, you’ll be confident with your selection, even once it’s already installed! This is obviously one of the most commonly chosen tile patterns throughout the world. It’s a classic choice which goes well with any size, material, and color of tile. It’s done by placing tiling next to one another, matching corner with corner to create straight, even lines. Pros: Can look great in any room of the home for virtually any tile need. And, it’s the easiest of all tile patterns to install. Cons: Not the best selection for smaller, more narrow rooms as it can trick the mind into thinking the room is smaller than it really is. 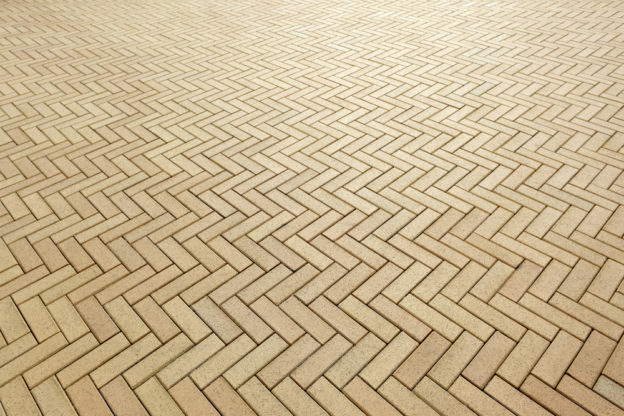 Otherwise referred to as the running bond layout, this is the pattern most commonly seen used with red brick. To start, a single row of tile is laid like the straight pattern. Then, the second row is placed by arranging the first tile at the center of the tile directly underneath it. While it can be done to square tiles, this pattern is mostly used with rectangular tiles. It’s mostly seen with subway tiles or glass kitchen backsplashes. Pros: Can be used in a number of settings like shower walls, kitchen backsplashes, flooring, hallway tiling, and much more. It’s relatively easy to install, so you may not need professional help if you’d like to attempt it. And, even you do make a mistake, the pattern is not symmetrical, so the natural eye usually doesn’t even spot it. Cons: It’s not the most dramatic pattern. So, if you’re looking for a pattern to wow your home guests, this may not be the style to choose. This is practically the same pattern as the straight layout, but tiles are tilted at 45 degrees so that they sit diagonally. The style calls for square tiles. And, when placed, these square tiles are no longer square, but diamond shaped. So, it’s also commonly referred to as a diamond pattern. Pros: This pattern, rather than make a small space look smaller (like the straight pattern), causes the mind to think that space is larger than it actually is. And, it’s relatively easy to lay yourself. Cons: This is obviously not the style for you if you want to go with rectangular tiling like subway tiles. And, it’s not the most strategic pattern out there. So, if you’re looking for something you don’t see every day, you’ll want to choose another style. This European pattern was named after the bones of a herring, which is a fish. It involves placing rectangular tiles into a “V” shape and repeating this pattern. It’s completed by placing one tile at a 45 degree and placing the next perpendicular to one of the ends of the first tile and repeating the process. Pros: When used in a narrow space, this pattern can also be used to make it look much larger. So, it’s a great choice for hallways and bathrooms. This is because the eye draws to the “V”, rather than recognize the sizing of the area. Cons: It’s relatively difficult to place this pattern of tile. So, it may be more costly to hire a professional. Additionally, when used in large rooms or spaces, it can be too busy if you’re looking for a more subdued setting. This pattern is one you may think is set at random. But, it’s actually set with 4 sizes of tiles, placed in a repeated pattern. The sizes of tile are both rectangular and square. When set, this style provides a naturally-organized style you can’t find with any other placement style. Pros: Great option for large areas in almost any room of the home. Provides a unique look that no other pattern can offer. Cons: Because of the complexity of this pattern and the high risk for making mistakes, it’s best to choose to have a professional lay tile in this style. Also, because it’s pretty busy, it’s best used for flooring only. Now that you have some tile pattern ideas for your own home, you’ll have to think about the demolition of the flooring you have currently. Of course, you could go about it yourself. Or, you could have the professionals come in with innovative dust-free technology and get your floor prepared for install within hours! To find out more about our dust-free floor removal services, visit our website or give us a call at 866-883-8783.